The Indian Arts Circle of New Orleans and Loyola University New Orleans will present an evening of sarod music on Friday, Sept. 9, at 8 p.m. in Roussel Performance Hall, located in the Communications/Music Complex, on the corner of St. Charles Avenue and Calhoun Street. 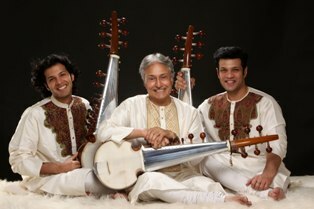 Co-sponsored by the Loyola Montage Fine and Performing Arts Series, the recital will feature celebrated musician Amjad Ali Khan and his two sons, Amaan and Ayaan, on sarod, a stringed musical instrument widely used in Indian classical music. The trio will be accompanied by Abhijit Banerjee on tabla, a popular Indian percussion instrument. Reserved seating is available for $75-$100, general admission is $25 and $50, and tickets for Loyola students, faculty and staff are $15. Tickets are available by calling 504-606-5938 or emailing iacno@cox.net. Tickets will also be available at the door 30 minutes prior to the performance. Considered to be one of the 20th century’s greatest masters of the sarod, Khan has performed internationally since the 1960s and is the sixth generation of an illustrious Indian musical lineage rooted in the Senia Bangash School of Music. He is the mentor of his two sons, who have followed in their father’s footsteps to perform around the globe. Banerjee is one of the most sought after creative artists in the realm of Indian classical music. In addition to a highly successful career in Indian Classical music, his crossover work includes collaborations with musicians such as Ry Cooder, Larry Corryell and Trilok Gurtu. Khan will also present a masterclass on Thursday, Sept. 8, from 2 – 3 p.m. Admission to the masterclass is free and open to the public. This event is supported by a grant from the Louisiana Division of the Arts, Office of Cultural Development, Department of Culture, Recreation and Tourism in cooperation with the Louisiana State Arts Council as administered by Louisiana Folk Roots.